IK's original T‑Racks invented the idea of 'one-stop shop' software for master processing. Do the improvements in version 3 keep it ahead of its rivals? New in T‑Racks 3 is a matrix that allows you to construct complex processing chains, although there is only limited control available from this overview window. Paul White reviewed the first version of IK Multimedia's T‑Racks mastering software in SOS February 2000 (/sos/feb00/articles/iktracks.htm), and since then it's come a long way. Back then it was a comparatively simple stand‑alone processing package for 16‑bit audio files, albeit with a suite of euphonic analogue‑modelled processors that quickly earned themselves a loyal fan base. Now it has reached its third‑generation incarnation, expanded with new virtual rack units, more flexible audio routing, and higher‑spec audio processing and metering. A new Compare function lets you evaluate mastering processing setups without the misleading effects of loudness differences between the processed and unprocessed files. The original cohort of mastering processors available in previous versions (Classic Equalizer, Compressor, Multi‑band Limiter and Clipper) are still present and correct, but have been supplemented by five additions. It comes as no surprise, given T‑Racks' history, that three of these model desirable analogue circuitry: the Fairchild 670 valve compressor, the Pultec EQP1A valve equaliser, and an apparently generic optical compressor (the controls of which nonetheless bear a striking resemblance to those of the Teletronix LA2A). However, the other two processors are something of a departure, offering new transparent digital limiting and EQ algorithms to complement the more colourful analogue‑style palette. The Fairchild and Pultec models take the purist approach of sticking with the control quirks and limitations of the original hardware, so, for example you only get the limited choice of EQ frequencies provided on original Pultec hardware. While this maintains a more authentic recreation of 'the sound', it can, of course, be a little frustrating in practice. That said, IK have included the Fairchild's DC Threshold trimmers, added as a modification to some hardware, which adjust the compression knee. Here you can see the range of adustment settings available for just the new spectrum analyser.Mitigating the control limitations of these thoroughbreds are the optical compressor and digital equaliser, which provide a much freer parameter range, and by nature of their sonic unobtrusiveness allow you to take up any slack left when you've pushed the Pultec or Fairchild as far as each will pleasantly go. As is becoming the norm in mastering software, the digital EQ now includes a Linear Phase mode, although this does introduce a lot more processing latency and can be switched off if not required. The original Fairchild 670 hardware is unusual in that it had M/S (middle and sides) processing facilities built in, and this feature is faithfully recreated in IK's model. 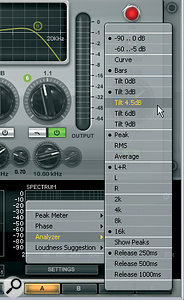 What's more, IK have included this function on the other two analogue processors and the new digital EQ too. The ability to pull the lead vocal or snare forward in a mix with middle‑channel EQ is just one of the useful applications for this feature, so it's great that it's included, although it's a shame that IK didn't also add this feature to the Classic range of processors. Five new processors make their debut in T‑Racks 3. Two of these are detailed emulations of the classic Fairchild 670 and Pultec EQP1A valve processors (top left and bottom right), while the rest (Opto Compressor, Linear Phase EQ and Brickwall Limiter) offer much more transparent processing.The digital Brickwall Limiter is fairly straightforward in terms of controls, but has nine different peak‑management algorithms to choose from. At the one end of the scale is distortion‑free limiting for critical applications, while the other eight modes balance different amounts and types of clipping and limiting to suit those more aggressive commercial productions that are willing to sacrifice a certain amount of sonic purity on the altar of raw loudness. If you put this processor into the final slot in the effects matrix, you can also take advantage of a special D‑A Distortion Protection routine that intercepts intersample peaks from loudness‑maximised masters and makes it less likely that they will overload the output electronics of some domestic playback devices. Whichever processors you use, T‑Racks 3 has extended their real‑world power and flexibility in two important ways. The first is that the Mac‑ and PC‑compatible program 'shell' now incorporates a 12‑slot matrix system allowing you to set up quite sophisticated series and parallel processing, and allowing you to use more than one instance of the same processor. The second is that if this built‑in processor matrixing still isn't flexible enough, or you want to combine it with other processors, you can now run the T‑Racks shell as a VST, AU or RTAS plug‑in. The bypass functionality is also less than ideal, with some very odd clicks, stereo anomalies and tempo judders reaching the audio outputs in normal bypassing and comparison tasks, both of whole effects and of individual EQ bands. I found that this made it much trickier to weigh up subtle processing decisions, especially on smoother and less transient‑rich classical or acoustic music. IK say these effects are a consequence of the complex delay-compensation routines they've put in place, and they could find no way to avoid them without compromising the oversampling and processing quality in multi-processor setups. That doesn't stop it being a royal pain, though. The Compare feature is handy, allowing the levels of both the processed and unprocessed files to be matched by ear while refining processing, in order to remove loudness differences from the equation. I could have done with more resolution (and a numeric read‑out) on the level control, though, and a facility to compare other reference tracks within the interface in the same way. The set of four buttons labelled 'A' though 'D' at the bottom of the interface allow you to instantly switch between complete mastering settings, which can also be useful, but are even more prone to audio gremlins than simple bypassing. The metering functionality of T‑Racks 3 has seen significant updates, which means that you now get peak‑reading and RMS meters, a vectorscope display with accompanying correlation meter, and a spectrum analyser. In addition, there's an intriguing Perceived Loudness meter, which is rarely to be found on competing products, and this has highlighted 'target' regions that can be shifted to different style‑related preset locations on the meter. The developers suggest that the way to use this meter is to play a number of your favourite reference recordings while watching the read‑out, to get a feel for how it responds to different records, and once you've developed some experience of how it works you can use it to inform your own decisions when it comes to loudness processing. I gamely spent some time poring over my own personal collection of reference tracks, but came away scratching my head, because the meter's read‑out often seemed to bear little relation to the loudness as I actually perceived it. In IK Multimedia's defence, I imagine that this is simply indicating what a freak I am, but if you're intrigued by the concept of this feature on paper, I'd seriously recommend checking that it actually works for you in practice before parting with any hard‑earned cash. Besides this criticism, the rest of the metering is pretty usable, with a good range of tweakable scale, ballistics, and weighting options and that particularly nice vectorscope display. Playback and audio editing facilities understandably grace only the stand‑alone version of the application, and are pretty basic. You load files to be mastered (and referenced against) into a little file‑list window, and a waveform display for the selected file appears to the right of the list for playback navigation and fade setting. 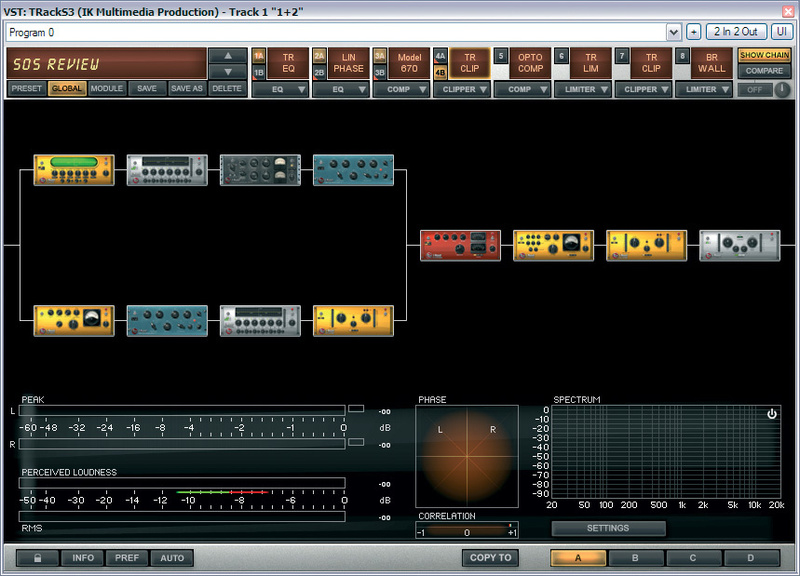 Again, lack of drag‑and‑drop re-ordering is a tedious omission from even a no‑frills audio playback device, but at least you can have a separate mastering chain per file, and can also add up to nine Snapshots of different controls settings per file, effectively allowing parameter adjustments mid‑file. You need to be a bit careful with the A/B/C/D buttons in all of this, though, as their settings aren't saved as part of the global T‑Racks project file. If you move on from one audio file with the wrong setting engaged, that's what'll be saved with the project file. I found this approach rather confusing — couldn't the settings of the A/B/C/D buttons simply be saved per audio file, with some kind of clipboard system for ferrying settings between audio files instead? If you're running T‑Racks as a plug‑in in your sequencer, you don't get the Snapshot facilities, but instead can choose to automate up to 16 controls from the host. You need to manually assign these parameters from a dialogue box within the T‑Racks interface, but once that's done, everything seems to work slickly enough. As a result of the various functional limitations of the interface, I found T‑Racks 3 quite frustrating to work with as a stand‑alone application, and I'd recommend using it as a plug‑in within another host if you plan on spending more than about 15 minutes with it! In this context, however, it becomes easier to concentrate more on that aspect of this software for which IK Multimedia have deservedly earned a good reputation — the sound. The raison d'être of T‑Racks has always been to enhance the file being mastered — to actually make it subtly better in some musical way, rather than simply adjusting the tonality or dynamic range to match other tracks. The existing Classic processors were already good at this, adding something more than 'just' compression and EQ and helping to smooth off the less attractive digital edges of primarily in‑the‑box productions. What's nice about the new analogue‑modelled units is that you now get some new shades of 'smoother' and 'warmer' to choose from courtesy of the Fairchild and Pultec, both of which will impart an extra sonic dimension even with no processing dialled in. So are IK's emulations of these units better than those from other manufacturers? Well, I lined up T‑Racks' Fairchild against Waves' Puigchild 670 and the Fairchild model in URS's Console Strip Pro to see what the differences might be. All of them offered closely comparable dynamic control characteristics, but the Puigchild had a bit more aggression, whereas Console Strip Pro seemed to have weightier bass. I wouldn't have picked out any of them as sounding categorically 'better', though, by any means, so I don't think IK's particular slant on the modelling process should really be the reason to go for T‑Racks if you already have another mainstream Fairchild emulation. Same goes for IK's Pultec, nice as it undoubtedly is. Where T‑Racks scores best is in bundling together a well‑balanced suite of high‑quality processors in an all‑rounder package, and I can see how the latest version's combination of analogue processing magic and clinical digital control might appeal amongst home studio owners looking for more than just a touch of class. That said, competition in this area is fierce, and I reckon IK would be unwise to let their software's control interface remain in its current under-developed state, because musicians with this much money to spend will justifiably feel they have a right to demand better. Probably the hottest direct competition to T‑Racks 3 comes from Izotope's freshly overhauled Ozone 4 [to be reviewed in SOS very soon — Ed]. This also offers a complete mastering environment within a single software 'shell', but it operates only as a plug‑in and not stand‑alone. The emphasis in Ozone seems to be less about recreating specific vintage sounds, and more about in‑depth parameter access and processing flexibility, albeit with a wide variety of vintage‑style tonal flavours on tap. Where Ozone scores for me is in its control interface, which gives more graphical input when setting up processors such as the multi‑band compressor, and offers easy preset navigation and device re-ordering in the processing chain. It's also cheaper than T-Racks 3. There are also other fish in the sea if you're in the market for mastering plug‑ins, and if you're ready to spend around £400-plus,$500 a few other names you might want to check out are BIAS, Crysonic, Nugen, RN Digital and Sonalksis, all of which could provide something approaching a mastering bundle for that kind of outlay, depending on your needs. More sonic options and greater processing flexibility via the five new modules and the built‑in effects matrix. 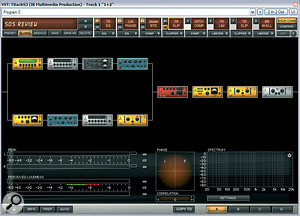 Can operate as a plug‑in within your sequencer or audio editor. Setting up and evaluating matrixed effects is fiddly and frustrating. There seemed only a loose correlation between readings on the Perceived Loudness meter and my own perception of loudness. Audio file playback functions still very basic. Interfacing and control problems undermine the usefulness of a good all‑round suite of processors that can really add something special to your mastering and mixing projects. T‑Racks 3 Deluxe (as reviewed) £436.99; T‑Racks 3 Standard £172.49. Prices include VAT. T‑Racks 3 Deluxe (as reviewed) $499.99; T‑Racks 3 Standard $199.99. IK Multimedia US +1 954 846 9101. Rain Recording Solstice O3 PC with AMD Phenom 9750 quad‑core 2.4GHz processor and 4GB DDR‑2 RAM, running Windows XP Pro Service Pack 3. Tested with Cockos Reaper v2.5.